On a cold day in January I got up close and personal with the coots at Fountain Lake, in Fountain Hills. They were walking all over the place, and I got a good look at their green, lobed, prehistoric looking, UNwebbed feet. Because their feet are not webbed, Coots are NOT DUCKS. The lake at Fountain Hills is very accessible, with wide sidewalks meandering around the lake, and through a peculiar frisbee golf course. The birds found here vary with the seasons, you never know who might migrate through. On this day we saw lots of American Coots, a few Canada Geese, Red-winged Blackbirds galore, lots of American Wigeons, with a few Mallards and Ruddy Ducks mixed in. Up in the landscaped areas away from the shoreline were Gila Woodpeckers, Verdin, Cactus Wren, and Annas Hummingbirds. We dined at the wheelchair-friendly Euro Pizza Cafe, with great views of the lake, and an excellent menu. If you're an early morning birder, Euro Pizza Cafe is even open for breakfast, and has a lovely outdoor dining patio so you can bird while you eat. So bring your appetite AND your binoculars! 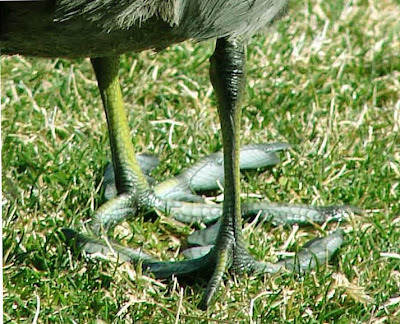 Thanks for that great picture of a Coot's feet. I think those are such interesting and unique feet.